I think dandelions are just beautiful. 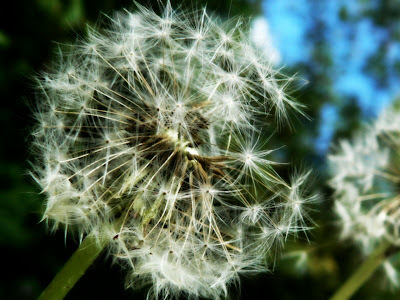 Well, perhaps not so much the flowers, but dandelion clocks are so lovely. I love the way the word too, dandelion, sort of, whimsical I guess. It's a pity to think that most people only see them as weeds. I don't think any of my dandelion wishes have ever come true, but it's nice to think of the possibilities. You know it's called "maskros" in Swedish? Thats "worm rose"...not very beautiful. Kram!